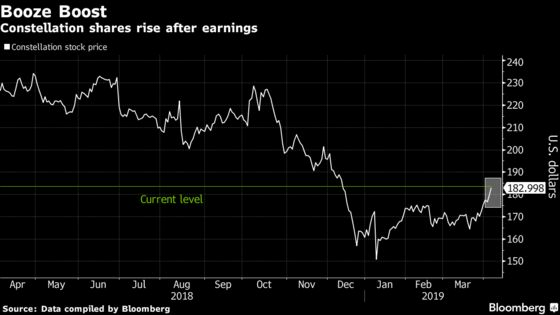 (Bloomberg) -- Constellation Brands Inc., the owner of Corona and Modelo beer in the U.S., rose the most among companies in the S&P 500 as fourth-quarter results and its move to offload less profitable brands fueled optimism on Wall Street. The company reported comparable earnings per share of $1.84, beating analysts’ average estimate of $1.71. The earnings give a boost to new Chief Executive Officer Bill Newlands as he reshapes the company’s alcohol portfolio in a bid to sustain growth. Constellation’s is shedding the lower-end wine and spirits brands to focus on more premium lines that sell for $11 or above. Growth in the alcohol industry, like some other consumer segments, has come from shoppers trading up to higher-end options. Profit in the wine and spirits unit will drop as much as 35 percent this fiscal year once it sheds the assets. Newlands, who just took over in March, is under pressure to prove he can sustain growth in Constellation’s beer business, which is anchored by the Mexican brands. The unit will see net sales growth of between 7 and 9 percent in fiscal 2020, it said, in line with the targeted high-single digit rate it announced in February. Constellation raised its profile last year by investing in Canopy Growth Corp., the world’s most valuable marijuana company. But it’s still early days for that business. 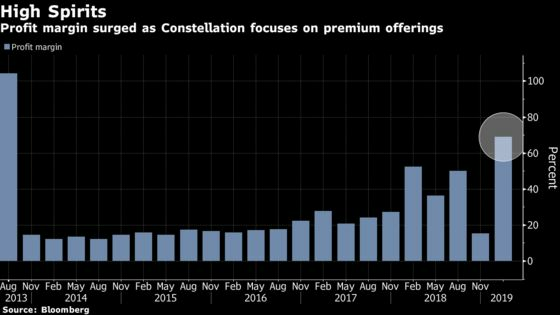 Constellation has said it will be at least another year before its weed investment adds to earnings. Canopy sells pot in Canada and is targeting the U.S. hemp market. Shares of Constellation rose as much as 6.7 percent to $191.79 in New York -- the most in three months. The stock has gained 19 percent this year, outpacing the S&P 500’s 15 percent advance. For the company’s statement, click here.